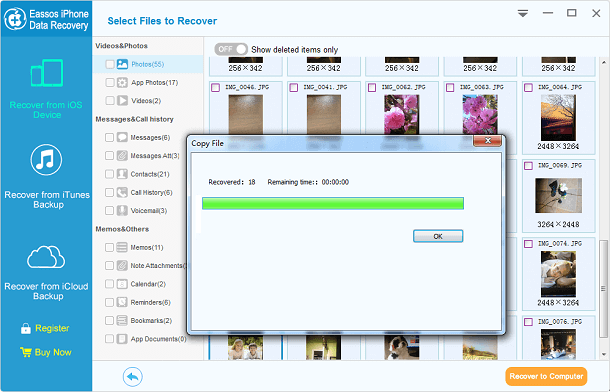 How to use Eassos iPhone Data Recovery? Eassos iPhone Data Recovery software is a safe and fast solution to perform iOS data recovery. 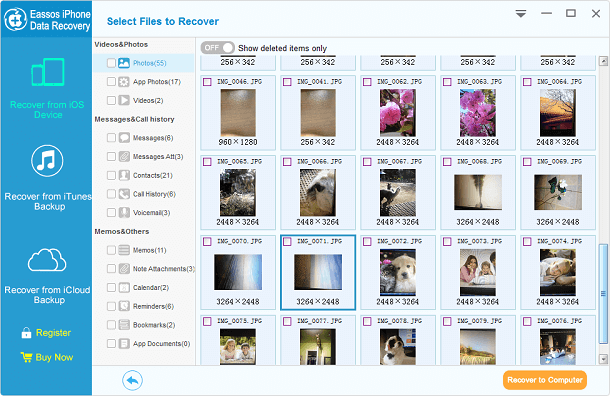 This iOS recovery software provides three data recovery modes: Recover from iOS Device, Recover from iTunes Backup and Recover from iCloud Backup. With these features you can recover deleted photos, contacts, messages, call history, notes and more from iPhone, iPad & iPod touch with a few simple steps. 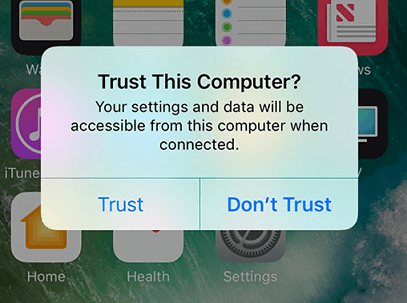 If the device is connected to computer for the first time, an alert will pop up asking whether you trust the computer. Tap "Trust" so that settings and data can be accessible from this computer. 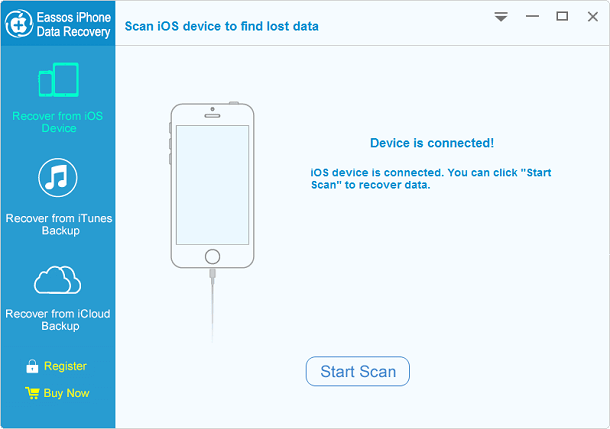 Select recovery mode and click "Start Scan" after iPhone, iPad or iPod is successfully connected, and this program will scan the device to find deleted or lost files. The scanning process may last a couple of minutes, which mainly depends on the amount of data stored on the device. 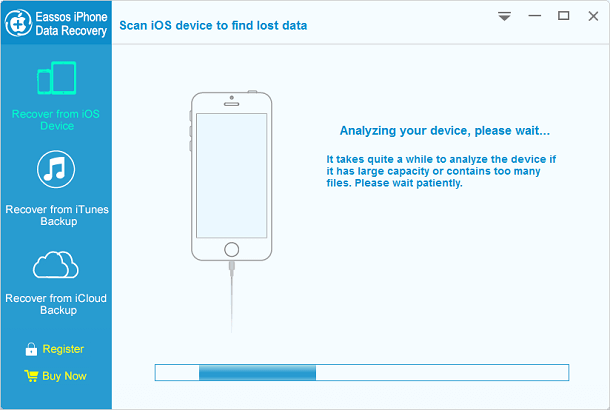 Once scanning is completed, you can see all recoverable files found by this iOS recovery software. Files are well organized by categories on the left side and you can click each type to preview files. Also you can double click files such as photos, video and audio files to view data with original quality. When you find the data you need, just select files and click "Recover to Computer" button at the lower right corner. Then you can set a location on your computer to save recovered data. "I just tried this application and it retrieves all contacts and messages deleted from iPhone 7 within in 10 minutes! Such a short time and great software! " "So far so good! Lost files have been found and listed in scanning result. It runs so steady and efficient. I love this iPhone recovery tool and really recommend it!" "It just worked! I was able to restore more than 100 photos which got lost after failed system upgrade. A huge thank to programmers of this recovery program." "Recovered contacts, SMS and videos quickly. The UI is simple and the onscreen instructions are useful, thus I did all steps correctly." Refund Policy: Do you provide refund guarantee?